Before we go any further, I just want to assure everyone out there who’s never made their own bread before. This homemade tortilla recipe is super easy to follow! I bake a lot of bread from scratch at home and out of all the different types I’ve ever made, I’ve got to say this is the easiest. There’s no fancy equipment, no yeast, hardly any rising time and no faff. Just basic kitchen skills that we all have. How do you make easy tortillas? Attach a dough hook to your stand mixer (no dough hook? ordinary paddles will do). Tip the flour and oil into the bowl and mix for 2 minutes. With the dough hook (or paddles) still turning, gradually pour in the water until it’s incorporated. Leave the mixer to do its thing for another 2 minutes. Form each piece into a ball in your hand and flatten it slightly with your palm. Leave each piece to rest for 20 minutes. You can use a little flour so the rolling pin doesn’t stick to the tortilla, but don’t use too much or it will burn in the pan. Spread a tiny amount (1/4 teaspoon-ish) of oil into the pan and cook the tortillas for 30-60 seconds on each side until golden brown. Check the recipe card below for measurements and more detailed instructions. How do you make easy tortillas without a stand mixer? Add the flour and oil into a large bowl and stir until a shaggy dough comes together. Gradually pour in the water, a little at a time, and continue stirring until you get a more robust dough. Tip the dough out onto a lightly floured surface and knead it for 3 minutes, until the dough really comes together. There’s no yeast, so you don’t need to do a lot of kneading. That’s it – you can follow the rest of the standard homemade tortilla recipe, beginning with separating the dough into 10 equal parts! Can I use different ingredients for this homemade tortilla recipe? I’m sure you can substitute loads of different ingredients. But I’m only going to recommend the ones I’ve actually tried and tested. I’d love to tell you that you can make this low-carb and gluten-free with coconut flour and coconut oil. But I’ve never tried it for myself. And I’d hate for you to waste loads of time and ingredients on a recipe I wasn’t 100% sure would work. Substitutes for water: nothing – every chef always has access to water! While we’re taking about substitutions, I’ll mention additions, too. I love adding things like dried herbs, cheese and fried onions into my homemade breads. But I’ve never experimented with adding any seasonings to this homemade tortilla recipe. Can you imagine how amazing it would be with a little cayenne pepper? I think you should be able to add any dried herb or spice to the dough and have the recipe work out for you. Just don’t go over-board. Maybe try adding 2 teaspoons of the herb/spice and then increase it after that if the flavour’s not right. Whatever you do, don’t add cheese, onions or anything else that will burn easily in the pan. Or your homemade tortillas will be covered in burnt black bits. And no one wants that. 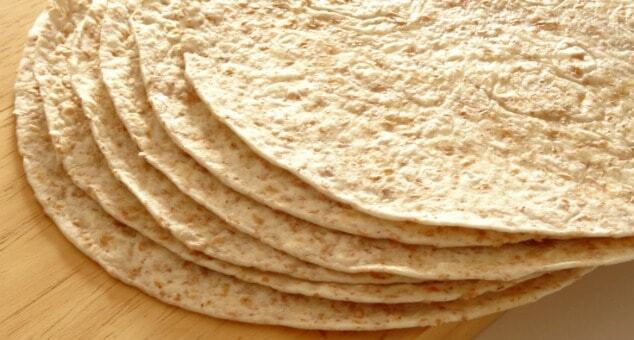 Make your own healthy, whole wheat tortillas at home with this homemade tortilla recipe. You only need 3 ingredients and 1 hour to create a great big batch of of delicious tortillas you can refrigerate or freeze for later. You'll never buy tortillas from the store ever again. In the bowl of an electric mixer with the dough hooks attached, mix together the flour and oil for 2 minutes. If you don’t have any dough hooks, use normal mixing paddles. While the mixer is still running, gradually pour in the water and continue mixing until the dough is smooth. This should take another 2 minutes. Divide the dough into 10 equal pieces and roll each piece into a ball with your hands. Slightly flatten each ball with the palm of your hand and leave to rest on a baking tray for 20 minutes. Heat a large skillet/frying pan over a medium-high heat. It needs to be really hot before you start cooking the dough. Use a rolling pin to roll your tortillas into thin circles small enough to fit into your pan. Be careful not to add too much flour when rolling the tortillas out – excess flour will burn in the pan. Pour a tiny amount of oil into the hot pan and spread it around with a piece of kitchen paper. With a spatula, carefully transfer one tortilla at a time into the pan and cook until puffy and slightly brown. Flip and cook on the other side until puffy and slightly brown. Cooking time takes 30-60 seconds per side. If any large air bubbles appear, pop them with a sharp knife. Keep your hands away from the scorching air that will escape. Serve the tortillas immediately or leave to cool to room temperature before wrapping in plastic wrap and refrigerating or freezing. Tortillas will store well wrapped in plastic wrap in the fridge for up to two weeks or in the freezer for up to six months. To heat up, warm in the microwave or in a dry frying pan/skillet. Great recipe share – thanks! The problem in Holland is sourcing ingredients and the fact that most small houses don’t have ovens. This is great – I can do it on the stove top. Although after 7 months here I can still only find 1.5 kg sacks of flour! Interesting… I have rarely been in a house in Holland without an oven, lol. Me either haha lived here almost all my life. Maybe she is a student? They usuallt have microwaves and a small stove. Wow – I want to try this! Thanks for sharing this!! I would love it if you linked this up to the Take it on Tuesday blog hop!! I love tortilla’s. My kids have taught me that they aren’t just for Tex-Mex food. Can’t wait to give it a try some time. I stopped eating white breads about 12 years ago. I MUST try this recipe and enJOY. Great directions. Thanks for sharing. Found you on Becolorful. These look perfect! It is so hard to find affordable whole wheat tortillas! I am definitely going to give this a try! I made tortillas before, and they were much easier than I thought! Thanks for sharing at Must Try Monday. What type of oil do you use? Is olive oil fine? Wow this looks super easy! I will have to try this on the weekend! Hope you enjoy them, Doris! How long will they keep in the refrigerator and freezer? If frozen how would you recommend to heat them back up? Hi Katie! You can keep the tortillas in the fridge for up to two weeks or in the freezer for up to six months. To reheat (either from chilled or frozen) simply place them in the microwave or in a dry frying pan for a couple of minutes until piping hot. Thank u for the wonderful recipe, but i do t have an electric mixer, how can i do it only by hands?? Hi Rahma! You can definitely follow this recipe without an electric mixer. Just stir together the flour, oil and water together in a bowl with a spoon until a dough forms. Then drop the dough out onto the counter (dust it with extra flour first so the dough doesn’t stick) and knead it by hand for 3-4 minutes. Gotta try this recipe. Just started making flour tortillas. Wheat would be so much healthier than white flour. Thanks for posting. How easy is that? I’ve never made these before but with your encouragement, it’s time to try! I loved this recipe!! It’s so easy to make!! Your tortillas look perfect!! Thank you so much, Ludmilla. That’s so sweet! what a great idea! I’m all about tacos. What a great recipe! I love making whole wheat tortillas! I can’t wait to try your recipe. I try to make bread at home too, but it can be very time consuming. Now these tortillas, no kneading or yeast you say? Now that sounds like something I can get behind! They’re definitely a fantastic bread to make if you hate working with yeast or spending all day in the kitchen! I have to try this – 3 ingredients wow! Yup – absolutely no kneading or yeast. That’s why they’re one of my favourite breads to make at home! I love tortillas! I can’t believe how easy they are to make! I’ve always been intimidated to make my own tortillas but these look totally doable! Thanks so much for sharing! No problem at all, Sarah! They were so much easier to make than I thought they would be. Oh my! 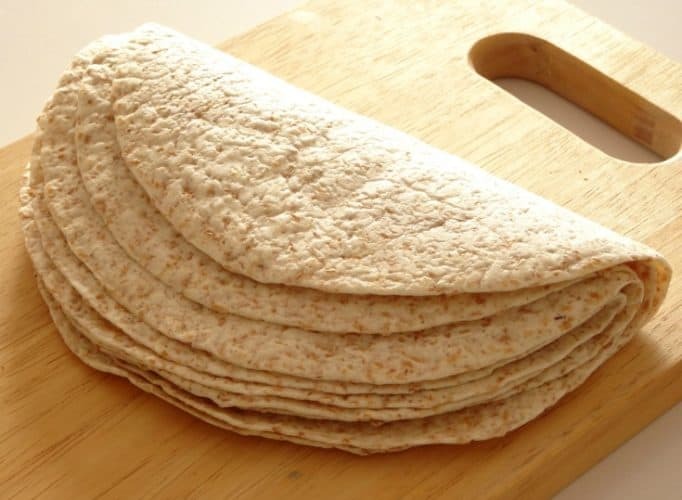 These vegan whole wheat tortillas look so delicious! I love tortillas so much and could eat them every day. Oh, wait, I do. 😉 I can’t wait to try your recipe! I love easy recipes! These look so delicious and I love that they are vegan. 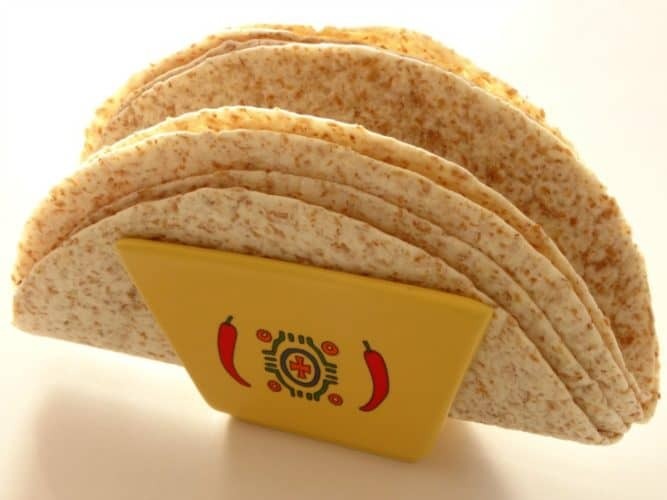 I’ve always wanted to try to make my own tortillas, and these look great! Definitely going to try! Aah..just the recipe I was looking for! Thanks for sharing. I love baking my own bread, but I’ve never tried to make tortillas before. Now I’m wondering why on earth I haven’t because ANYTHING like that you make yourself is ever so much better. I’m going to give it a shot! 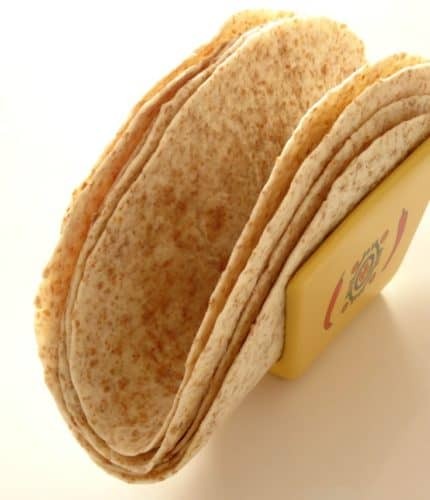 When I divide the dough into the 10 sections and roll it out, what size tortilla should I expect? 8 inch? 10 inch? I want to use them for wraps. I can always make fewer to make them larger, but wanted a starting point.